SEO - Skip to content. Reading a book opens a new world to a young mind. 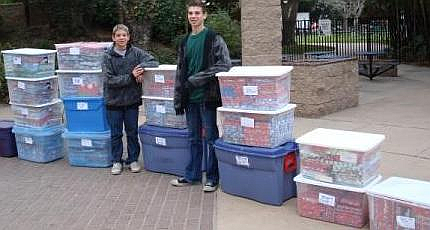 The Camarda Bookcase was founded in 2007 by two brothers, Michael and Nick Camarda, who wanted to promote literacy and make holidays special for underprivileged children in Orange County. It has grown dramatically since it's founding in 2007. 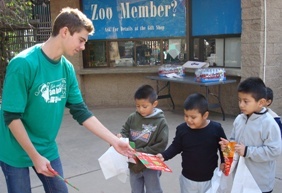 Countless volunteers have helped collect, sort, catalog, gift‑wrap and distribute books to disadvantaged children. Initially, only books for children ranging in age from infant through teens were accepted as donations. Now, all types of books are accepted including books for adults. Books were initially distributed only during the holiday season but are now distributed throughout the year. The Santa Ana Police and the California State Park Rangers were given gift‑wrapped books to distribute during their patrols. Gift‑wrapped children books were donated to the Santa Ana's El Salvador Community Center for their holiday parties. Books donated to John Raya's TKO (Turn Kids On) Youth Boxing Club in Santa Ana were used to create an afterschool program's library. Children books were donated to The Path of Hope Foundation in Fountain Valley for their holiday party and a resource library. Books on the subject of horses were donated to a newly created library at the J.F. Shea Therapeutic Riding Center in San Juan Capistrano. Books for adults were donated to the Camp Pendleton Marine Base to be use to raise money for the wounded soldiers and their families. Donated parenting and self help books created a library for Laura's House in Mission Viejo, the only comprehensive domestic violence shelter in Orange County. Partnered with National Charity League where the NCL provided children books to Operation Help A Hero's Operation Bedtime Stories (OHHOBS). Operation Bedtime Stories coordinates video recordings with copies of children books to deploying units. These recordings provide an opportunity for deploying service members to record themselves reading bedtime stories to their children right before deploying. 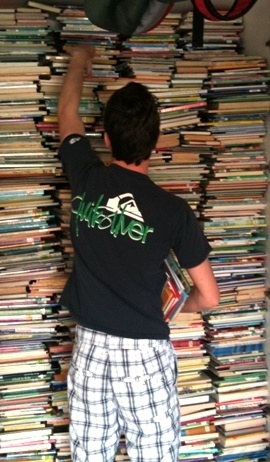 Books donated to Dr. Olga Mohan High School were added to the school's library. 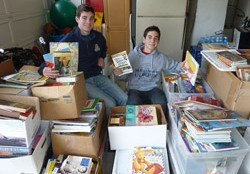 Over 50,000 books have been provided to the disadvantaged in Orange County! Containers are labelled by age and gender. 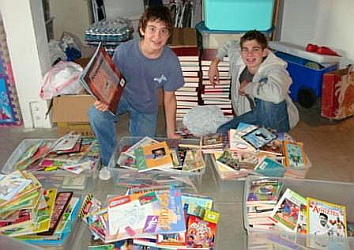 Nick and Michael Camarda sorting donated books in 2007. Content Copyright © 2007-2017 The Camarda Bookcase Non‑Profit Organization. All rights reserved. Website created by Dvorák Development, Inc. The Camarda Bookcase promotes literacy by distributing donated books to the disadvantaged.